Back with the team he enjoyed so much success with during the 2017 NHRA Mello Yello Drag Racing Series season, LE Tonglet is looking forward to putting on another show at this weekend’s NGK Spark Plugs NHRA Four-Wide Nationals at zMAX Dragway. 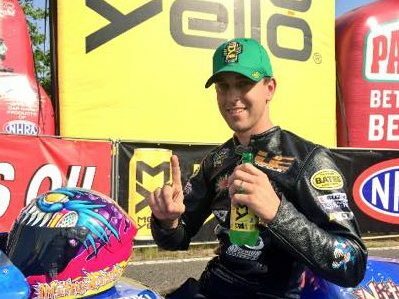 The former Pro Stock Motorcycle world champion announced earlier this week he was returning to the White Alligator Racing team owned by 2016 world champ Jerry Savoie, hoping to recreate the magic and success that led to six wins a year ago. The first of those started in Charlotte, where Tonglet thrived in the thrilling four-wide racing set-up on his KPK/Nitrofish Suzuki. He has long enjoyed the unique and exciting race, and expects continued success this weekend. LE Tonglet and Jerry Savoie reunites once again. Steve Torrence (Top Fuel), Ron Capps (Funny Car), Chris McGaha (Pro Stock), and Tonglet (Pro Stock Motorcycle) were last year’s winners of a race that will be televised on FOX Sports 1, including a broadcast of the finals on Sunday, April 29 at 6:00 p.m. (ET). 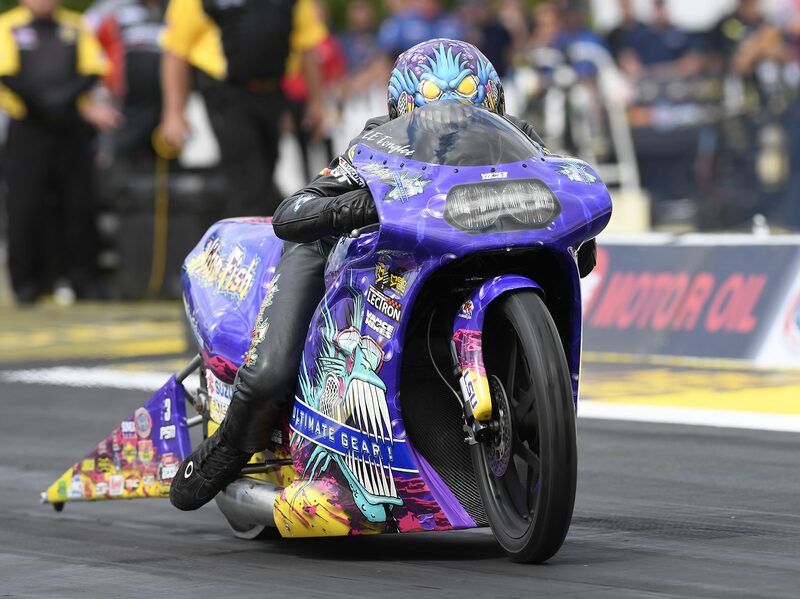 The event is one of the biggest spectacles in drag racing, and marks the second of 16 events in Pro Stock Motorcycle. Tonglet heads to Charlotte reinvigorated after joining back up with Savoie. That tandem won a combined eight races in 2017, with Tonglet looking to regroup after qualifying 15th and losing in the first round to defending world champ Eddie Krawiec, who went on to win the season-opening race in the class at Gainesville. Back with the White Alligator Racing team, Tonglet feels that success will happen, as the bike will be set-up exactly like it was a season ago when he enjoyed plenty of success. 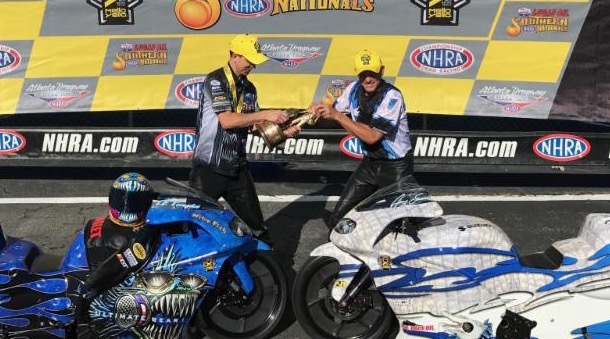 Tonglet found the winning formula at zMAX Dragway a season ago, performing well on the starting line en route to the victory. 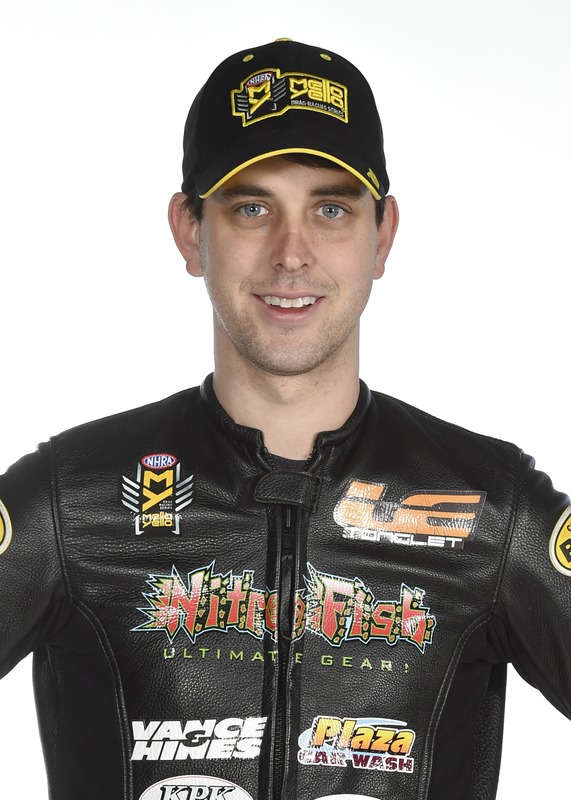 He’ll face off against 20 other talented riders this time, including Andrew Hines, Hector Arana Jr., Scotty Pollacheck and three-time world champion Angelle Sampey, but the 2010 world champion is confident in what he will be able to accomplish at the fan-favorite race. 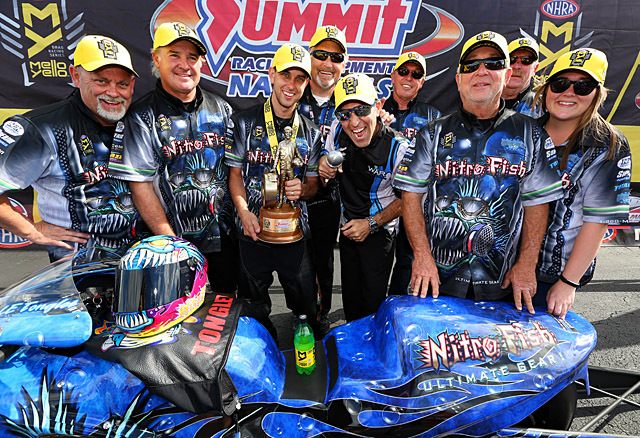 L.E Tonglet and Team Nitro Fish in the Winners circle.